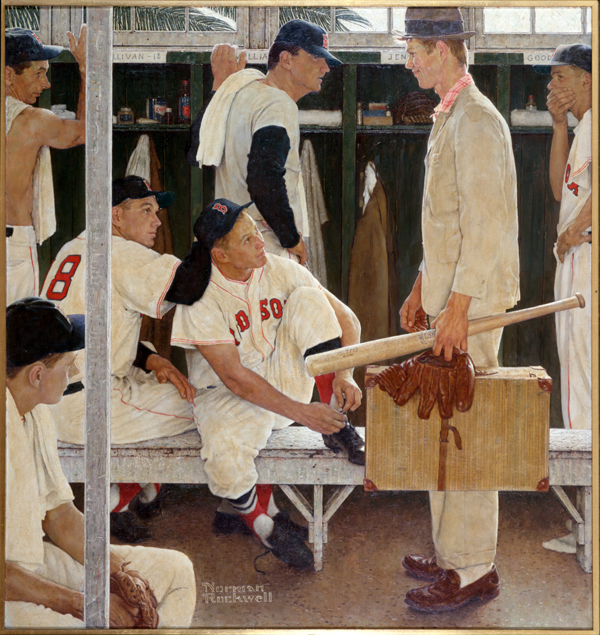 Norman Rockwell (1894-1978), The Rookie (Red Sox Locker Room), 1957. Whether you’re a Red Sox or Dodgers fan, we’ve got you covered during this World Series weekend. Visit our exhibition of all 323 of Norman Rockwell’s Saturday Evening Post covers, and look for such classic Rockwell baseball paintings as Hundredth Year of Baseball, The Dugout, Game Called Because of Rain (Tough Call), and The Rookie (Red Sox Locker Room). For The Rookie, created for the March 2, 1957 cover of The Post, Rockwell painted original Boston Red Sox players, including catcher Sammy White, pitcher Frank Sullivan, right fielder Jackie Jensen, and second baseman Billy Goodman. Hall of Famer Ted Williams is also pictured, but unlike the other players, he did not travel to Stockbridge to pose for the artist’s picture; photos were sent instead, and Rockwell used a stand-in to perfect the pose and likeness (much to baseball fans’ chagrin). Local Pittsfield High School student Sherman Safford modeled as the rookie. Back in 2014, Safford visited Norman Rockwell to talk about his experience posing for the memorable baseball cover. Watch a special segment below, filmed for CBS News.